In 2008 we bought our 41ha property in Rockleigh and set to work on the worst weeds (ignoring the rampant salvation jane (Echium plantagineum) and wild oats (Avena spp.). 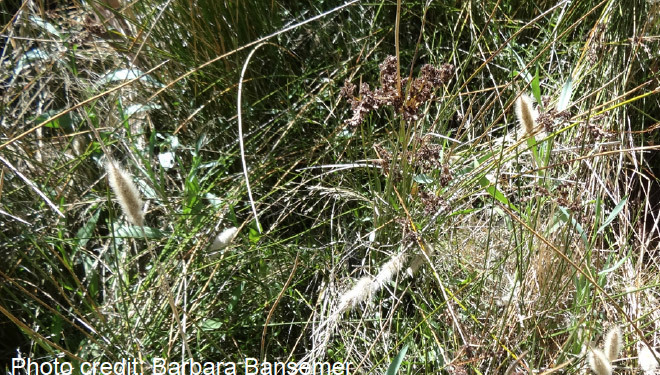 At that stage there were scabious (Scabiosa atropurpurea) along the roadside, false caper (Euphorbia terracina) rapidly heading to our boundary and assorted thistles (Onopordum acanthium) and galenia (Galenia secunda) in the creek line. Each April/May we had to hunt out and spray bridal creeper (Asparagus asparagoides), each October/November monadenia (Disa bracteata). All was going moderately well using hand-pulling, spraying or cut & swab techniques with glyphosate. Bridal creeper, scabious, false caper and galenia were starting to look conquerable. Figure 1: Galenia everywhere after the fire. 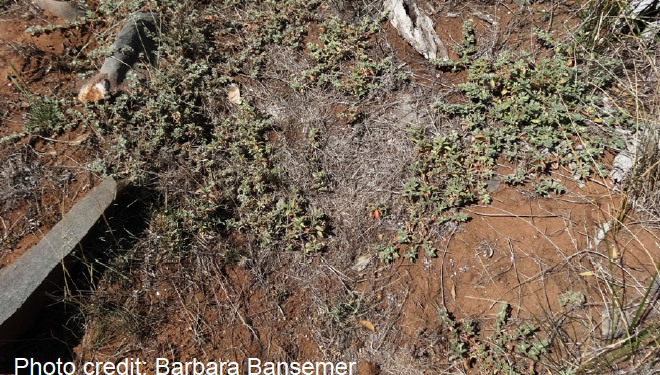 Figure 2: Barbara’s husband in a sea of weedy saltbush. Then on 14th January 2014 everything changed. Lightning scored a direct hit and fire swept everywhere. The 6,500 local provenance seedlings we had planted over five winters, and 8ha of direct seeding were burnt to a crisp. In our naivety we hoped that maybe the wild oats and cape weed (Arctotheca calendula) seeds had succumbed. We anticipated prolific growth of wattles (Acacia sp.) which need heat to activate germination. We were dreaming. In September the land was a spectacular panorama of purple salvation jane and yellow cape weed, with oat grass as prolific as before the fire. As for the wattles, the seedling score so far is about fifty, from thousands of burnt bushes. In the creek bed the weeds had a blank palette to work on. Tens of thousands of galenia seedlings sprouted. Aided by 125mm of rain in February, weedy saltbush (Atriplex prostrata) germinated along the entire 400m creekline and thistles of various species came up by the thousand. Figure 3: Before pulling 31 wild aster. 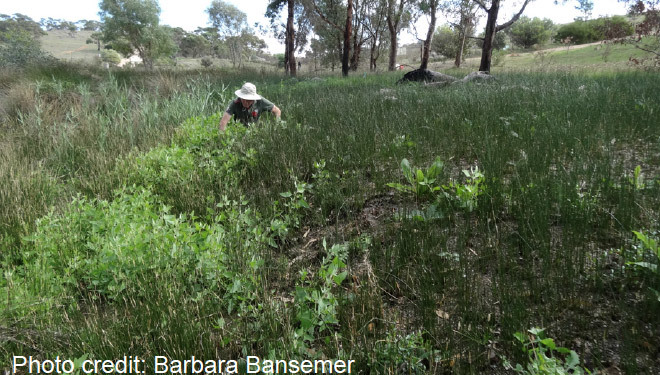 We organized a working bee and twelve pairs of willing hands removed all of the weedy saltbush, for the time being anyway, while galenia and thistles continued to flourish. Through winter and spring we continued to pull out the saltbush, a job made progressively harder as the rushes regrew. Thankfully thistles are easier to spot. Bright green, they poke out above the rushes and shout “We are here!” Pity about the nasty prickles! We chop the flower heads off before cutting the plants into short sections. Just when we thought we were winning (silly us), by the middle of November a new enemy had appeared. Before the fire several large flowering wild aster (Aster subulatus) plants had been removed, but unfortunately the fire failed to destroy their seeds. Now by late January we have pulled out thousands of seedlings hiding in newly-grown rushes, risking eyes poked out by sharp tips of sea rush (Juncus kraussii), and collecting many spikes in the backs of our hands. Every visit, we find hundreds more.